In today’s complex digital marketplace, a website alone is no longer sufficient. Online consumers now have countless potential paths to your virtual front door, and an integrated strategy is required to fully capitalize on these opportunities. It is still important for law firms to have a professional attorney website, but that’s only the beginning. Today, more than half of all internet connections are made through a smartphone or tablet, so a responsive version of your website that is aesthetically pleasing to mobile consumers is an absolute must. Social media is another area that is growing exponentially, offering another way for legal professionals to engage their target audience. So how can attorneys find the time to put together an integrated legal web marketing strategy? That’s where FindLaw comes in. My name is Glenn Rhodes and I’m your FindLaw client development specialist for Macon, Savannah, Brunswick, Valdosta, Albany and communities throughout South Georgia. I have over two decades of legal industry experience, and I have partnered with numerous local attorneys and law firms to bring greater online marketing success. I have in-depth knowledge of both the local markets and FindLaw’s comprehensive suite of market-leading integrated web development tools, and I continually monitor what is working (and what is not) so my clients are always on track toward achieving their goals. If you are looking for a partner with the experience and expertise to help your firm grow and prosper, contact me to schedule a free consultation. When you are investing in a solution to help grow your clientele, you want assurances that the marketing company you are working with knows what they’re doing. FindLaw has local experts on the ground with real-time knowledge of what is happening within the communities throughout South Georgia. We are not only local experts, we are also online marketing specialists backed by FindLaw’s vast resources and industry-best integrated attorney web marketing solutions. Our experts continually monitor the local markets, and we know what is working and what is not working to put law firms in a position to grow and flourish. At FindLaw, we have helped nearly 20,000 legal professionals achieve their online marketing goals, and we can do the same for you. Glenn, in his own words. FindLaw is the legal industry’s most trusted web development company. With an exclusive focus on law firm internet marketing, we offer a holistic solution that works synergistically to accelerate the success of our clients. At FindLaw, we deploy our best-in-the-industry integrated legal marketing programs to help lawyers and law practices in southern Georgia compete effectively – regardless of the level of competition. 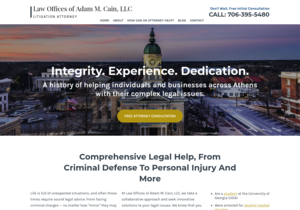 Our award-winning attorney web designs are exactly what law firms need to present a professional brand online, and all our content is written from scratch by professionals with in-depth knowledge of your area of practice. Working in conjunction with our legal SEO strategies, law firm blogs, social media promotion methods, online attorney videos, Legal Directory ads and other top integrated solutions, FindLaw’s programs position legal professionals to survive and thrive within their local digital marketplace.